Happy Friday! We’re excited to give you some great updates on the world of global health security. Firstly, a recent cluster of what some are calling “rabies” has claimed the lives of 12 individuals. Officials are concerned as transmission seems to be spread through biting and the affected individuals do not appear to be experiencing pain or concern over decaying skin. Just kidding – April Fools’ Day! The zombie apocalypse hasn’t started (that I know of…. ), but the European Centre for Disease Prevention and Control (ECDC) has issued a warning about Yellow Fever in Angola. The ECDC is stressing the role of vaccination in travelers as a means to prevent the disease from traveling to susceptible populations. 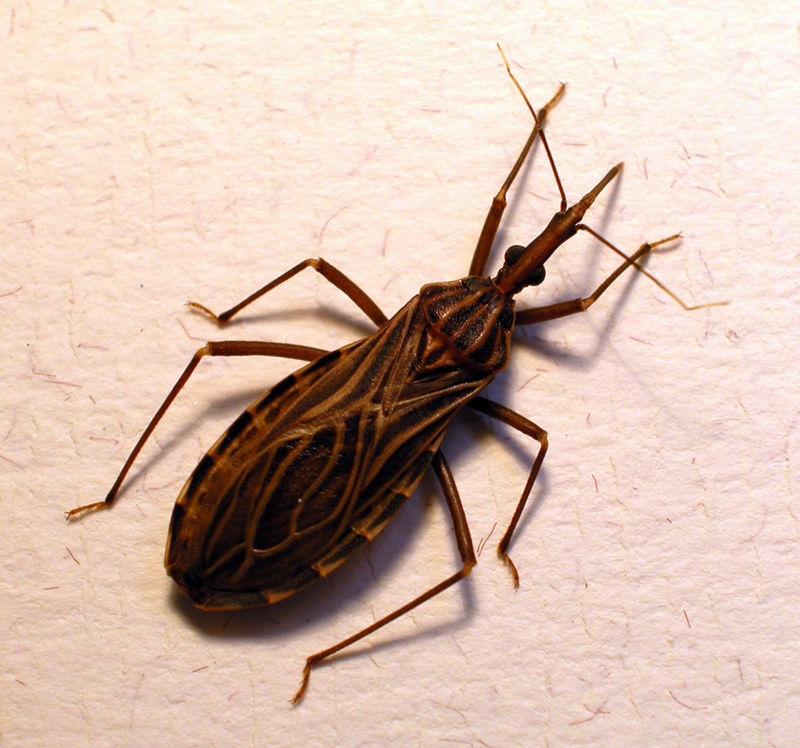 Researchers from the University of Sydney’s Charles Perkins Centre recently published their analysis regarding the barriers and facilitators for pathogens to jump species. They reviewed 203 human viruses to look at biological factors that may give us predictors as to which viruses are likely to emerge in human populations. Raad Fadaak discusses the Global Health Security Agenda (GHSA) and its set of 11 Action Packages, working to better “prevent, detect, and respond to both human and animal infectious diseases threats.” Fighting an uphill war with organizational and political challenges, the GHSA has won some battles in the fight against global health security threats. In the midst of their MERS outbreak last year, South Korea looked to GHSA “to invest both diplomatic commitment as well as approximately $10 billion US dollars—in addition to graciously hosting the annual GHSA Ministerial High-Level Meeting.” Perhaps a challenging component to getting the GHSA and its Action Packages running smoothly is the vast array of partnerships and projects. Raad uses several wonderful spatial graphics to show timelines, participating countries, commitments, and much more in his analysis of GHSA. “Speaking more generally, it is important to not take the ‘global’ in ‘global health security’ for granted. These maps are a first step in helping to identify and isolate the unique scope and reach of US Governmental activity under GHSA programs – and the production of a specific kind of scalar policy through the GHSA.” In the midst of the Zika outbreak, now will be a telling time to see how the US will meet its commitments to the GHSA through the CDC and USAID. It’s been two years since the first Ebola cases were identified in Guinea. Since then, you’ve surely read articles upon articles about the outbreak, how it spiraled out of control, and how we should’ve seen it coming. Why read more? History. Plain and simple – if we fail to study this outbreak and learn from all our mistakes, we’re doomed to repeat them. Ranging from infection and prevention control measures (music to my ears) to addressing the needs of Ebola survivors and social mobilization, there’s host of things we can learn. “And even when international partners responded, they often arrived too late. It took about three months from the time the United States announced in September 2014 it would send troops to Liberia to build Ebola treatment units (ETUs) to the time those were built. By then, the epidemic was already waning, and nine out of the eleven centers built never saw a patient.” What about fear? Fear became an issue not just on the ground in West Africa, but also in the U.S. after we started treating imported cases and the initial Dallas, TX case. “But I think we did most poorly when we let fear dictate the quality of the clinical care we provided to patients. ‘What if,’ Dr. Paul Farmer provokingly asked, ‘the fatality rate isn’t the virulence of the disease but the mediocrity of the medical delivery?’ Of course lack of staff, supplies and space, combined with an overwhelming patient load didn’t help.” Coordination, communication, and engagement. You may see these repeated several times whenever you read an after action report about this outbreak, and yet I’m not quite sure we’ve really let it sink in. Zika? Let’s just hope we can learn from the lessons of public health history before another outbreak sneaks up on us again. Update: two more cases have been identified in the now nine person cluster in Guinea. A young woman has died of Ebola in Liberia today, marking their first case in months. US knowledge gaps are the name of the game this week. 1/3 of Americans polled in a recent survey believed that Zika virus can be transmitted from coughing and sneezing. This same survey, conducted by a team from the Harvard T.H Chan School of Public Health and the National Public Health Information Coalition (NPHIC), found that people in households not affected by pregnancy issues held the most misconceptions about the virus. 39% thought that a non-pregnant woman’s illness could pose a threat to future birth defects. Brazil’s Health Ministry reported that the number of confirmed and suspected cases of microcephaly associated with Zika virus in the country have grown to 5,235 cases. The ministry also reported 19 infant deaths related to the virus. 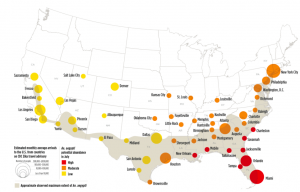 Revised estimates and a map released by the CDC now show that a larger percentage of the US population could be exposed to the virus as the mosquito season approaches . The University of Texas Medical Branch, Galveston (UTMB) has developed the first Zika animal model since the recent outbreak. “Several research institutions and companies have vaccine and drug candidates nearly ready to test, but until now a mouse model – a critical stage in preclinical testing – has not been available. The study, published this week in the American Journal of Tropical Medicine and Hygiene (AJTMH), removes a major bottleneck that was delaying treatment screening.” There is also concern regarding the ability for ultrasounds to fully detect brain damage and microcephaly in pregnant women with or exposed to Zika virus. If you’re looking to get your Zika on, attend the Zika Innovation Hack-a-thon April 2-3, 2016! As of March 30, 2016, there were 312 travel-associated Zika cases in the US. Ebola Is No Longer A Public Health Emergency of International Concern – On Tuesday, March 29th, 2016, the WHO Emergency Committee met, noting that since its last meeting, all three countries met criteria for interruption of original transmission chains. The WHO Direct General, Margaret Chan, stated that any trade and travel restrictions initiated during the outbreak should be lifted. Ethiopia Drought Emergency – Ethiopia is currently experiencing the worst drought it’s had in 50 years, causing water and food security issues. As of March 2016, over 10.2 million people need food assistance. Food security issues and poor access to water are severely impacting the agricultural industry as well as human health. Spring is upon us! Whether you’re suffering from allergies or enjoying the bloom of the cherry blossoms, we’ve got you covered from the biodefense side. Don’t forget to add our GMU SPGIA Master’s Open House to your calendar next week (Wednesday, March 23rd at 6:30pm at our Arlington Campus). We’ll also be hosting a biodefense breakout session at 7pm with Dr. Koblentz (bonus: you can attend virtually! Extra bonus: our MS program is offered online, so you can learn to be a biodefense guru from anywhere in the world!). Bioarchaeologists are at it again in their quest to determine the fall of ancient Rome (hint: Yersinia pestis may have played a larger role than you’d think). Here’s hoping that with the announcement of the new Indiana Jones movie we’ll see Indy doing some bioarchaeology on ancient biowarfare! Emerging infectious diseases are not a new concept for global public health, so why did Zika and Ebola catch us so off guard? Where was prevention – the backbone of public health- in this fight? After the pledging of billions of dollars and deployment of countless health professionals, the reality of reaction versus proactive prevention was never more apparent than during the Ebola outbreak. As the old saying goes, “an ounce of prevention is worth a pound of cure”. Now, as we trudge our way through the Zika virus outbreak, many wonder why the Aedes mosquitoes are continuing to cause devastation when their role in outbreaks is so well known. “Controlling this mosquito would by itself ameliorate all these disease threats. Ironically, in South America, control of Aedes aegypti was largely successful earlier in the 20th century (with great expenditure of effort), only to be abandoned once the immediate threat receded.” So again, we must ask ourselves, why public health prevention measures are so frequently ignored. Inexpensive in comparison to the cost of an outbreak, these tools (surveillance, diagnostics, worldwide communication, etc.) are increasingly becoming stronger and more available. Zika and Ebola have proven the efficacy of these strategies and the damage of failing to use them, so what more will it take to get global public health measures a seat at the cool kids’ table? A recent study addressed the biosocial approaches to the Ebola outbreak, concluding that “biomedical and culturalist claims of causality have helped obscure the role of human rights failings (colonial legacies, structural adjustment, exploitative mining companies, enabled civil war, rural poverty, and the near absence of quality health care to name but a few) in the genesis of the 2013-16 pandemic.” Globally, we’re still struggling to recover from the outbreak – whether you’re on the the ground in the affected countries or in the public health agencies that attempted to help. In many ways, the lessons from this pandemic will continue to be identified and understood for years to come. The CDC has also just released an article regarding the perspectives on the outbreak here, where they discuss the factors that delayed disease detection, the role of civil instability, and the impact of historically limited ebola experience. Are you a GMU Biodefense alum? Don’t forget to sign up for the SPGIA CareersNow so you can get updates on job postings that are right up your alley! GMU has close ties within the biodefense industry and we love joining students with employers, so please make sure to sign up and utilize this great resource! Officials are reporting on that on Saturday, terrorists linked to ISIS fired rockets into a residential part of Taza, a northern Iraqi town. These rockets are reported to have contained unspecified chemical substances that caused numerous deaths and injuries related to burns, dehydration, and suffocation. An American special forces team previously captured the lead ISIS chemical weapons engineer, however, “his capture has not stopped alleged chemical attacks by ISIS or other terrorists associated with the Islamist militant group. Earlier this week, for instance, officials in Iraq’s Kirkuk province claimed that around 100 people were injured in suspected chemical attack, also in Taza.” The attacks are recently reported to have injured 600 people and killed a 3-year-old girl. Many are now asking, where is ISIS getting their chemical weapons from? Recent CDC data reports 258 travel-associated cases within the US. Laura Beil with the New York Times describes the worry that pregnant women are now facing after they traveled to affected regions and later were found to have Zika. 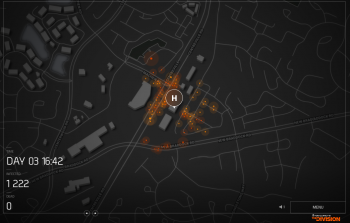 You can also find a timeline and map of the outbreak here. Here’s a spot of good news though – the European Commission announced on Tuesday that the European Union released $11.1 million for Zika virus research. Rob Stein from NPR discusses the unique cry of babies with Zika-associated birth defects and the stories from the pediatricians and health professionals that are working to help the affected families. “It’s not just that they cry more easily, and longer — which they do. There’s also something strange — harsher and more pained — about the cries of many of these babies. The realization that they even cry differently than normal babies drove home how many mysteries the world is facing because of the Zika virus.” Not surprisingly, ticket sales for the 2016 Summer Olympics have dropped since the announcement of the outbreak. Olympic-related event ticket revenues dropped 56.4% since mid-January. A new research article was just published regarding the seasonal occurrence and abundance of the Aedes mosquito and it’s role in potential Zika transmission within the US – specifically in regards to local transmission. Here’s a great map regarding the estimated risk of transmission within the US. Rice Krispies Food Safety Attack? An employee was recorded urinating on the production line for the cereal manufacturing company in 2014. Kellogg is now under investigation regarding the criminal activity and potential impact of the employee’s actions. I wonder, would you consider this a small-time biological attack? TGIF! We’ve got loads of global health security updates to keep you busy why you enjoy the warm spring weather. American special forces recently captured the chief ISIS chemical weapons engineer and you may want to avoid Wonderful Co. pistachios for a bit as they’re being linked to a salmonella outbreak. Video game fans will be excited to hear about the new Tom Clancy game, The Division, released on March 8th. This isn’t your normal action-packed video game, but rather it has something more sinister about its premise. The Division focusses on a biochem attack involving a take over by a group called the Strategic Homeland Division aka “The Division”. The Division is compromised of sleeper agents that “act independently in the interest of restoring order after a mass event”. Now here’s where it gets spooky, the game’s premise involves a scenario that may give deja vu to many in the biodefense world- Operation Dark Winter. Operation Dark Winter was a June 2001 exercise/senior-level war game put on by the Center for Strategic and International Studies, the Johns Hopkins Center for Civilian Biodefense Studies, the ANSER Institute for Homeland Security, and the Oklahoma City National Memorial Institute for the Prevention of Terrorism. The scenario focussed on the impact and response of a smallpox outbreak coupled with tensions in the Taiwan Straits and additional crises. In a nutshell, the scenario found that “current organizational structures and capabilities are not well suited for the management of a BW attack”, media management would be challenging for the government, containment and infection prevention would present several issues, and we’d pretty much be in a whirlwind of trouble. If you’re more of a purest and The Division doesn’t appeal to you, there’s also The Collapse, which is an internet-based game that lets you simulate a smallpox outbreak. Unlike other games where the player designs the outbreak, this one is from the viewpoint of the patient. You’re patient zero with a weaponized strain of smallpox and your decisions carry with them a world of outcomes involving the spread of the disease and rate of infection. I spent some time playing The Collapse (starting at GMU for sheer irony) and found it to be very detail oriented and enjoyed the decision making components like which pharmacy I would go to, my travel destination, etc. If you’re not much of a gamer, here’s the recent WHO report on the deliberations regarding the destruction of variola virus stocks. To destroy smallpox or not to destroy smallpox, that is the question. Looking to study and work with people that share your love of biodefense? Come check out our March 23rd GMU SPGIA Open House at 6:30pm, in Founders Hall, room 126 at our Arlington Campus! Not only will you be able to chat biodefense, but we’ll have an informational session afterward (7pm) with Dr. Koblentz (you can check out the 2/25 one here). Each session allows us to discuss global health security and answer questions related to our program and the growing field of biodefense. Can’t attend in person? Enjoy our 3/23 biodefense breakout session virtually! If you happened to miss our biodefense course sampler from 3/2, check out the recording from Dr. Koblentz’s talk on Biosecurity as a Wicked Problem. Biodefense expert, Milton Leitenberg, discusses the allegations by North Korea, China, and the Soviet Union, that the US used bioweapons during the Korean War. While the Soviet Central Committee declared the allegations fraudulent in 1998, China and North Korea continued to maintain that bioweapons were used. The recent publication by Wu Zhili (previously the director of the Chinese People’s Volunteer Army Health Division during the Korean War) refutes these claims. Published posthumously, Wu’s testimonial is critical in dismantling the claims as he was “critically involved in the Chinese government’s manipulations that produced the Korean War BW allegations.” The initial allegations claimed that the US was testing bioweapons (specifically plague) on native Inuit peoples of Alaska and then was spreading smallpox in North Korea between December 1950- January 1951. The major allegation campaign began on February 22, 1952 though, as “the North Korean Foreign Minister again issued an official statement addressed to the United Nations Secretariat, charging that in January and February the US had made multiple air drops over North Korea, littering the earth with insects infected with the microorganisms that caused plague, cholera, and other diseases.” Leitenberg discusses these allegations and the Soviet admission of being “misled” and their claims that “the accusations against the Americans were fictitious…Soviet workers responsible for participation in the fabrication of the so-called ‘proof’ of the use of bacteriological weapons will receive severe punishment.” He goes on to discuss Wu’s publication and explanation of the tasks that were carried out to further the belief in US bioweapon applications. CDC and NIAID officials are becoming frustrated as they feel Congress is blocking key efforts to fight the outbreak. 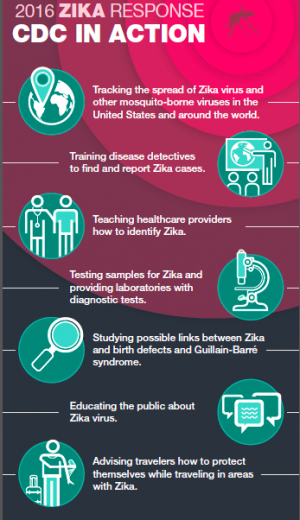 A recently published report on research priorities to inform public health and medical practice for domestic Zika virus can be found here. The report emphasizes the growing spread of infection and subsequent need for additional research related to transmission, infection during pregnancy, and disease characteristics . The recent WHO stakeholders meeting provided updates on the most urgently needed tools to fight the growing pandemic. The roadmap includes diagnostic tests, inactivated vaccines targeted to childbearing-aged women, and new vector control mechanisms. As of March 9th, there were 193 confirmed travel-associated Zika cases in the U.S. A recent study found that 42% of questioned Americans believe the virus has high mortality rates. Aedes mosquitoes are also developing resistance to the go-to insecticide. Feeling like all this Zika news has you needing to catch up on your outbreak cliff notes? The Washington Post has put together a nice list of seven books and movies you can enjoy to help ramp up your knowledge regarding the world of pandemics. This list is a great way to understand the different viewpoints of outbreaks and pandemics from social, medical, political, and scientific viewpoints. If you find yourself wanting more, here are some additional recommendations I’m throwing in: Spillover by David Quammen, Pandemic: Tracking Contagions, from Cholera to Ebola and Beyond by Sonia Shah, and The Coming Plague by Laurie Garrett. Feeling like something a little bit more dramatic? Check out Richard Preston’s The Hot Zone or Demon in the Freezer, or the movies Outbreak or World War Z. With the success of Contagion, I’m still hoping Hollywood will continue to back scientifically grounded films about pandemics (between ebola and Zika virus, they’ve got enough material!). Fumbling Ebola– The San Francisco-based epidemiology company, Metabiota, is being charged with making several mistakes according to the Associated Press (AP). Recovered communication reveals that the company fueled an already chaotic situation via misdiagnoses, adding to confusion, and poor sample tracking. Guidelines for Ebola Survivor Care– The WHO has published guidelines on the management and care of patients who were previously infected with Ebola. Since there are roughly 10,000 ebola survivors and several have required hospitalization for complications, these recommendations are extremely prudent. The report includes counseling, considerations for special patient populations, and common sequelae and management recommendations.